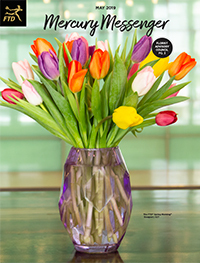 The Mercury Messenger newsletter was created to inspire and celebrate florists, as well as share the latest advantages of being an FTD member. It is produced four times a year and a printed version is inserted in the FTD Clearinghouse Statement as well as emailed during the months of February, May, August and November. If you are not receiving the Mercury Messenger, send your email address to FloristRelations@FTDi.com. Share your pictures and/or success stories with us for an upcoming newsletter by sending them to FloristRelations@FTDi.com. Please include the full name of each person in a photo along with your shop name, city and state.